A living parable walked into freedom in Burma/Myanmar recently. Aung San Suu Kyi is among those who awaken our stagnant conscience: “I should be like them. Everyone should.” They’re the true norm. Saint Francis is one of those parables. So is Solzhenitsyn. Gandhi is a third and Mother Theresa is a fourth – and then there’s Mandela. Hollywood’s glitz and glitter dims and sinks into now-insipid tinsel and sequins. Our frilly celebrities become pale, and we see our newly-elected tough-guy leaders for the thugs they are. We feel shame. We reward the attack ads. We elected those people. We could do better. We could be like Aung San Suu Kyi. She shames us all the more because she could have evaded the darkness. Her father established the modern Burmese Army and negotiated the nation’s independence in 1947. Rivals assassinated him, but her mother played a major political role and Suu Kyi lived in privilege: She attended college in New Delhi and Oxford, lived in New York and worked in the United Nations, married a scholar named Michael Vaillancourt Aris, earned a PhD from the University of London, and was a fellow at the Indian Institute for Advanced Studies. We would have understood if she chose the exiled life while her nation writhed under the junta’s grip. She had a husband; she had kids. She could have taught, filed protest letters, toured the lecture circuit, written articles and books and appeared on Charlie Rose. You have responsibilities, Suu Kyi. Puff your children’s pillows and sing them their lullabies. But she couldn’t walk away. A historical swirl propelled her into the leadership of Burma’s pro-democracy movement after she returned to care for her ailing mother in 1988. The Junta banned gatherings of more than four, but Suu Kyi campaigned anyway as the 1990 elections approached. “Fearlessness may be a gift,” she once said, “but perhaps more precious is the courage acquired through endeavor, courage that comes from cultivating the habit of refusing to let fear dictate one’s actions, courage that could be described as ‘grace under pressure’ – grace which is renewed repeatedly in the face of harsh, unremitting pressure.” She displayed incredible courage when she walked alone in the face of soldiers aiming guns with shoot-to-kill orders. A major countermanded the order and she went on to her rally. Something yanks and our internal veil falls. We can deny it no longer: Each of us should possess that graceful courage. All should be willing to walk that road. All should smile their way into the lion’s den. The National League for Democracy won 59% of the popular vote and 80% of the seats in Parliament. The Junta refused to recognize the results and Suu Kyi has been under house arrest for 15 of the last 21 years. She has been separated from her children. The generals refused to allow her dying husband to see her (they welcomed her to visit him abroad; she suspected they wouldn’t allow her back), and he died of prostate cancer with no good-bye. Yes. Of course. How obvious – and how appropriate for our nation as well as hers. I don’t easily stand in awe of anyone. But Aung San Suu Kyi has walked through the darkness. She is one of those gems illuminating the true definition of what “normal” should be. 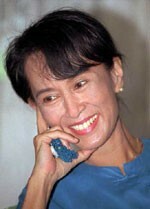 And so I can say with a straight face and in all seriousness: I want to be like Aung San Suu Kyi. Charles Redfern is a writer, activist, and clergyman living in Connecticut with his wife and family. He's currently writing two books, with more in his head. Genuinely definitely very good website article which has got me considering. I never looked at this from your point of view. Click on the date ..